I'm so glad to see an app like this in the marketplace. However, I can't use it for digital painting and illustration yet because of one MAJOR missing feature: Tablet pressure controlled opacity with the paint brush. As it stands you can set pressure on brush size and flow (among other things) but for digital painters opacity is the most important pressure control you can have. I'd say it's pretty darn important for retouchers as well. Please add this feature soon, because as of now Affinity Photo is unusable for me. It will arrive, but in the mean time there is a trick to obtain a very similar effect. Create a 1024px file for the nozzle shape, using a a similar level of gray for its fill, but add some noise. Your base is done, now set Wet Edges On and you're done. Do not use all available pen pressure (to keep wet edges modulation low). Ok, I know it is not an Opacity Jitter but the final result pretty similar. Bumping this, I didn't even know AD/AP was missing this, I always assumed it had it because it seemed otherwise pretty well thought of (I haven't painted in AP/AD yet as I have other software too). This is single most important brush feature of any art software and surprisingly it is missing from many. Maybe because of many users use mouse instead of drawing tablet and with mouse flow makes sense - however it is useless for painting with tablet. however it is useless for painting with tablet. This will be no more an issue because Matt and Andy told us it is baking and I'm sure it will be out soon. This feature will be acclaimed by digital painters. What you say is true, opacity jitter is missing from many. 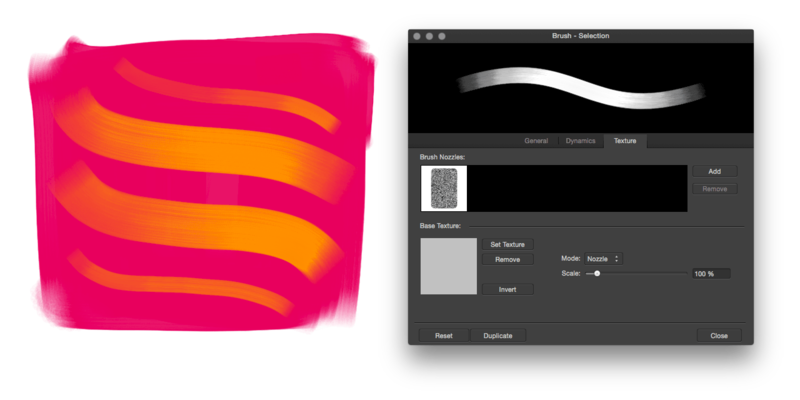 Among professional digital painting APPs a real opacity variance is featured only in PS. To use it in MangaStudio you have to override Flow/Density variance. Painter (even 2016 version) still doesn't feature it. Yep, I didn't say AD is be unusable with tablet, I said flow is (well for me, your workarounds seem impressive). Good to know there's a fix coming. And yes it's weird that this feature is missing so widely! It doesn't exist in Substance Painter either (3d texturing software) but it apparently is in 3d Coat (another 3d texturing/sculpting software). I got another workaround too, which involves Luminosity Jitter, a custom ramp with cut-off (now possible) and blending mode. Results are really fine and I'm looking forward to Opacity because all these things all together open the gates of a large number of possibilities. No Wet Edges here: you need a simple brush, blending mode set to Average and Luminosity Jitter with an almost linear ramp cut-off (to keep limits away). But it may be quite unstable for Macs: it depends on your system. Then again, my students have been running Krita on the classroom's iMacs without too many issues so far. Unfortunately Krita cannot be considered a professional APP on OSX. Linux is the best platform for Krita, and there are lots of artists using it proficiently. My intention was to list OSX industry standards in digital painting, and today it is a question among Painter, MangaStudio and Photoshop. Yes, agreed. Krita is quite usable on Windows, but for Mac use it is not there yet, unfortunately. I would never use Photoline for digital painting, btw - the brush options are far too limited. I love drawing in ClipStudio (Manga Studio)! I too would like to see "Tablet pressure controlled opacity with the paint brush". This is a feature I used like breathing in photoshop and really do miss it and need it a lot. Sure am loving Affinity Photo over all and it's just wonderful how it was a one time purchase and has such a great support forum. I seem to have pressure controlling opacity in both Designer and Photo. Without pressing down the "force pressure to control size" button in the top tool bar it works fine when using my tablet. 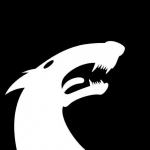 @retrograde: the new 3.0 alpha is out, and according to mac user reports it is becoming viable now. I seem to have pressure controlling opacity in both Designer and Photo. :blink: Are you sure Kevin? Any update on this? Fix coming soon?? I'm still interested in this, also. 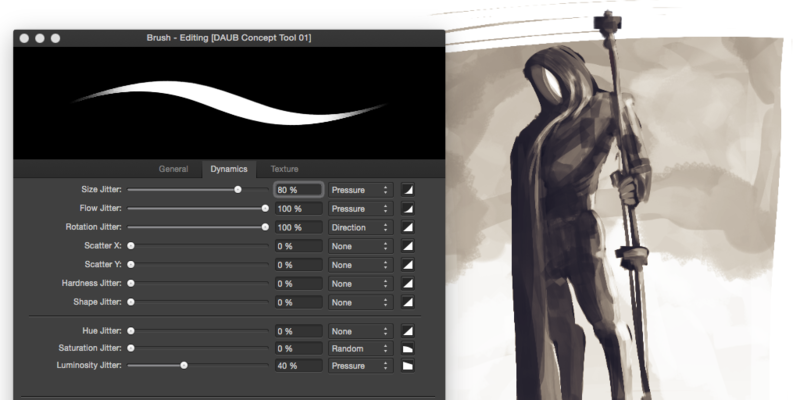 There is a very particular way opacity works in PS and it would be super nice if Affinity had the same brush feel. 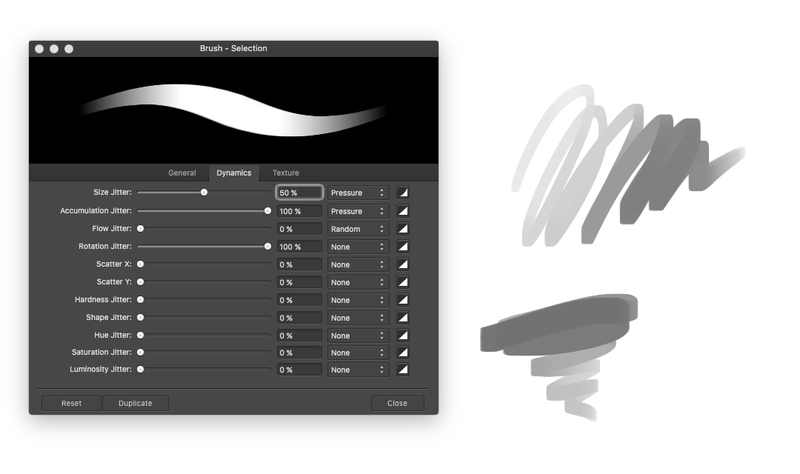 In general, brushes feel far from perfect, sometimes choppy curves appear where PS was perfectly smooth on the same hardware. It is available in both AP and AD 1.5 Beta. It is named Accumulation Jitter and works exactly as in PS, moreover you can control the pressure curve (in PS you can't). Opacity is still available but it is constant. Where is that accumulation jitter ? I don't seem to be able to find it in brush settings. UI and UX designer extraordinaire, dad, avid Destiny player, and generally striving for decency. Here you can find that brush, no need for the workaround anymore. It's again some kind of workaround. OK, I'm new with AP, but if I would like to feel myself at home like in PS, or reccommend it to my collegues this is a MUST BE! Otherwise PS will still be a King and I'd like to support the alternative too. So I have to put it in a Brush properties and since I can not see brushes as icons (? ), I'll have to browse all the time as mad, not to be able to see whether this feature is active or not. VERY UNCOMFORTABLE! ... and I want to use this feature with ANY brush or Eraser. Please add a knob or shortcut (or both). Hello, I just download ( 10 min ago ) to give it a shot as it is promesing ... but I really have to admit that opacity pressure is something I need for my work ... I understand Affinity Photo is mainly for Photo I guess ... but brushed are there and we cannot get the full capacity of it ... I just cannot work without it... even though Ihave 10 trial days I'll probably stop the next hour cause I'm not able to play with the opacity pressure .... from 2015 'till today it is a gap and hell I am attracted by affinity ... but cannot work with it for now. Do you guys have any updates ? Thanks anyways ... it's a shame for now ... Hopefully an answer will be given , I really hope.